Omg this is so cute! Please, you have to upload the video to video.google.com !!!! You must let everyone see! oh yeah, I forgot to suggest. Why not try the game on a surface that has more friction? i couldn't get the video to work, but i'ld love to get my hands on some live action katamari. great idea. i hope you have some thought of marketing this. i know a pile of ppl who would be into katamari tournaments. That is Terrific Did you do tis with velcro? and felt? Its great i can just se playing this like a contest for real. Gee we could have katamari tourniments! Awesome! 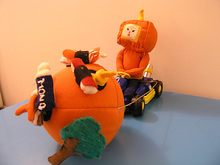 How is the katamari ball attached to the RC car? Bah. As cool as this is (and truly, it is): Ace is the only choice for cousin. 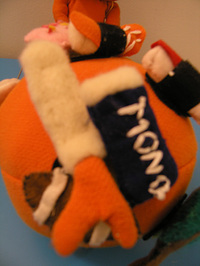 Put some weight inside the ball so that the velcro presses down onto the objects it rolls over. We'll show our toy here!! 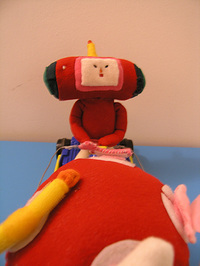 but now,not any more,this katamari dolls really attract me,your page is my #1 favorite now ! 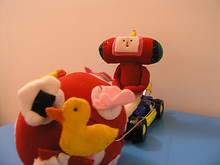 this katamari dolls really can compete with RC toys !!!!!! 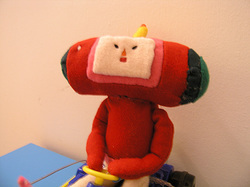 Na, na na na na na na katamari damashii. omg ha ha ha! na na na na na na na na na na katamari damacy! katamari on se swing! i want one!